Media Spinning New Seth Rich Report Saying "Hired Killer" Or Serial Murderer Killed DNC Staffer - Botched Robbery "Not Likely"
A new report, which is embedded below, after a three month investigation by The Profiling Project, which consists of a group of volunteers who are current and former George Washington University forensic-psychology graduate students and instructors, have concluded that the murder of a DNC data analyst, Seth Rich, was not the result of a "botched robbery" as DC law enforcement officials claim. 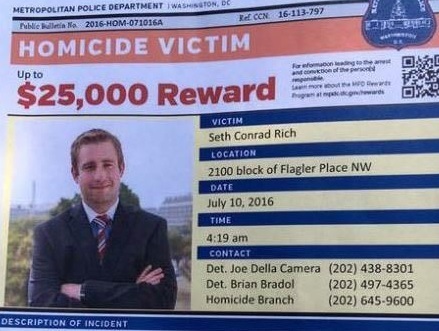 Brief Background- On July 10, 2016, amidst the Hillary Clinton campaign and DNC being roiled by Wikileaks publications of DNC emails and Podesta emails, Seth Rich, a DNC data analyst, was shot two times in the back, murdered. At the time, Wikileaks had made it abundantly clear that despite reports claiming the DNC and the Clinton campaign had been hacked, the information given to them came from a "leak," not a hack. 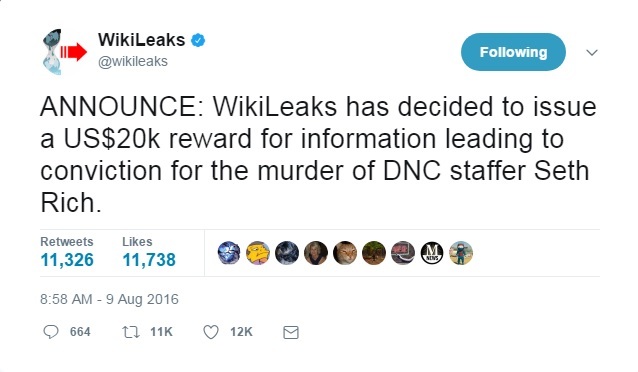 After the murder, Wikileaks first offered a $20,000 reward and second, Wikileaks founder Julian Assange was interviewed, spoke directly about the "risks" that leakers faced, then used Seth Rich's murder as an example of those risks. On page two, categorized as "Executive Summary," The Profiling Project notes six specific findings after their investigation of all publicly available information: 1) Seth’s death does not appear to be a random homicide; 2) Seth’s death does not appear to be a robbery gone bad; 3) Seth death was more likely committed by a hired killer or serial murderer; 4) There may be additional video surveillance of the crime and crime scene; 5) The resolution of prosecuting the individual(s) responsible appears to be hindered both actively and passively, and; 6) Seth’s killer(s) most likely remains free within the community. Readers can see the report below, including evidence looked at and the methodology used in making their determinations. Beneath the report we take a look at how the "media" is already attempting to spin the report, while ignoring some of the most important information that has been released to date regarding the murder of Rich. One of the first high profile publications to address this report was Newsweek, who accurately states The Profiling Project's assertion that Rich's death was more likely committed by a hired killer or serial murderer, in their article but only refers to the possibility of a "serial murderer" in their headline. The Newsweek report is more interesting as to what they deliberately leave out of their article than what they include. Example: In their very first paragraph they state: "A serial killer is likely behind the murder of North Carolina Democratic National Committee staffer Seth Rich, according to forensic-psychology students and instructors, who spent three months investigating the homicide." It is not until the next paragraph that they acknowledge the "hired killer" portion of point #3 in the Executive Summary. What Newsweek deliberately neglects to mention is the reason those so-called "conspiracy theorists" believe Rich was behind the Wikileaks trove of DNC and Podesta emails, first and foremost, because the Wikileaks founder, Julian Assange, had previously assured the public the emails did not come from a "hack" but were actually "leaks." Assange had participated in an interview with Dutch television program Nieuwsuur, where he spoke of the risks that those that leak information face, then directly highlights Seth Rich's murder as an example. He goes on to refuse to directly say that Rich was the leaker of the DNC and Clinton campaign emails because Wikileaks policy is never to expose or name their sources, but his statement is obvious, and is even highlighted by the man interviewing him. Newsweek also neglects to mention that the very same day Assange participated in that interview, Wikileaks tweeted an offer of a $20K reward "for information leading to conviction for the murder of DNC staffer Seth Rich." The Newsweek article also references Brad Bauman, a spokesman for the Rich family, who issued a statement saying the Profiling Project states in its methodology that it "was given no special access to any materials, evidence or persons, and due to case sensitivity, conducted only informal, limited interviews." The Rich family was not provided a copy of the preliminary report, never saw the report or was otherwise consulted in the preparation of the report. I received the report a half an hour before it was made public thus depriving myself, the family or the family's lawyers any reasonable time (to) review it. As noted, by the report's methodology, 'The Profiling Project' was given no special access to any materials, evidence or persons and due to case sensitivity, conducted only informal, limited interviews. Given that fact, the family hopes that the general public takes the findings at face value---valuable experience in research collection and report writing for students at George Washington University but in no way should take any findings contained within as new, credible or otherwise lending credence to conspiracy theories surround the circumstances of Seth's death. We further hope that this doesn't continue to impede the Metropolitan Police Department's ability to find the killers and give folks who might have information to their arrest cover to stay silent. 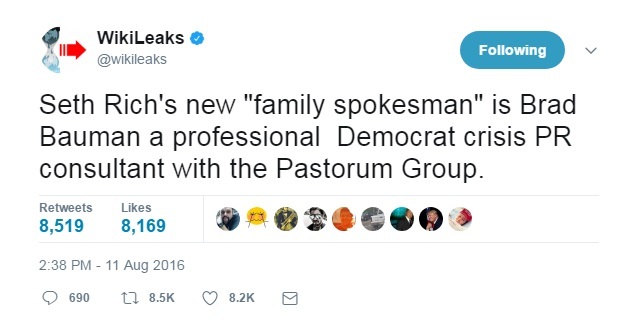 What Newsweek and WJLA does not report is that Brad Bauman is a a professional Democrat crisis PR consultant, as highlighted by Wikileaks on August 11, 2016. According to his LinkedIn page, Bauman's experience is listed a a partner for The Pastorum Group and "Managing a crisis communications and full service public relations firm," as well as being a communications consultant "Providing strategic communications advice to Democratic candidates and labor unions." Both those positions are listed as current. Side note on Bauman: It appears that he runs a foundation in his name called the "Bauman Foundation," and Media Matters founder David Brock, the man who "built an empire to get Hillary Clinton elected," sits on the Board of Directors. Last note on Bauman: No one seems to know who is paying Bauman, as the family maintains they have not spent any of the money donated at their Go Fund Me page. Newsweek, nor WJLA, acknowledge that it is not just "conspiracy theorists" on the right that believe Rich was murdered because he was the Wikileaks source, but Seth's own cousin, stated publicly in a reply to Sean Hannity, "First thing I said when my Dad told me was he knew something and he was murdered. The rest of the family thought I was nuts. See last name." That tweet was later deleted after another family member reprimanded for speaking publicly about his belief, with Andy Rich stating "This is not the place & not a topic for you to comment on. I love you but filter bro. #family", but it was archived. Newsweek claims in regards to this report that "As for the conspiracy theories, the Profiling Project says those are unfounded, given that Rich did not die immediately at the scene: "A professional killer, whose sole job would have been to terminate Seth, did not accomplish their mission prior to escaping." While report does offer that direct quote, what Newsweek doesn't inform their readers of is the important caveat offered directly after that sentence, pages 28, 29, 30 and 31, where each theory that has been posed by a variety of sources are addressed and in each case the following sentence to what Newsweek shows is "Positive toxicology reports would be needed to support this theory." In fact the report doesn't even say the "theories are unfounded," they say they are "Not Likely, unless a toxin was introduced into Seth." 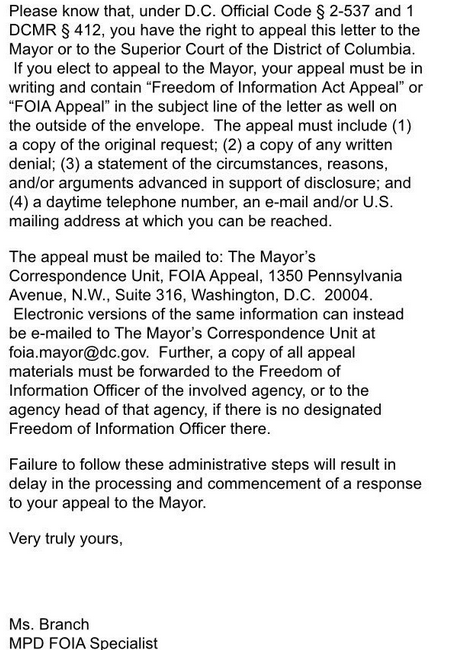 To date, Seth Rich's autopsy report, including the toxicology report has not been released to the public, and the man who funded this group report, Jack Burkman, who also has offered a $105 reward for information leading to the solving of the murder, has filed a Freedom Of Information Act (FOIA) request to have those reports released. In late May the Profiling Project filed an open records complaint against D.C.’s mayor and attorney general, which states "The case is now clearly a cold case. As such, the release of the desired information would not and would not harm MPD’s efforts in any way, as there is no continuing effort." 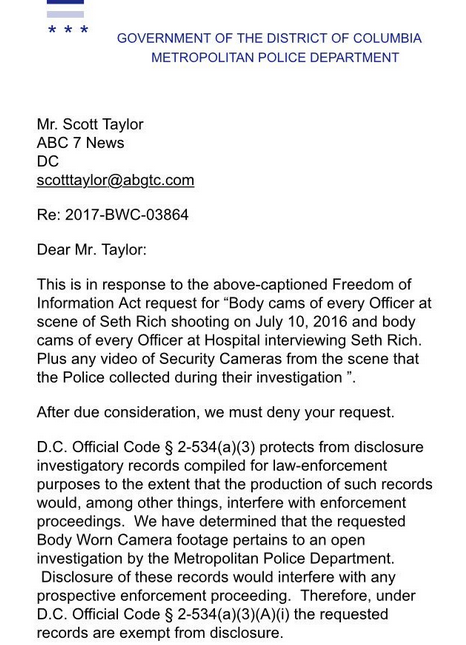 On June 1, 2017, ABC News 7 Investigative Reporter Scott Taylor, also provided a "Seth Rich Update: which states "Here is denial of my request 4 video of Police Officers body cams at crime scene & Hospital plus surveillance video." In response to a question about whether similar items had been released before, Taylor tweeted "Body cams in homicides have been released in the past in #DC." It is great to see that local affiliate investigative reporters are at least trying to get to the truth, even as their national counterparts are busy spinning or completely ignoring the issue. Kudos to Taylor. The Profiling Project report states the theory of a "random robbery gone bad," that law enforcement continues to push is "not likely," as they detail the behavior profile of not only robbers but of Seth Rich, given his predisposed behaviors disclosed by Rich's father. The report spends two pages, #26 and #27, providing their analysis and comments in regards to why that theory is "not likely." The report is well researched and comprehensive, but due to stonewalling of local authorities, information needed to either confirm or debunk a number of theories, is being kept from the public and from the researchers as well as local media. The coverage so far has been dismal and as the Newsweek article shows, they neglect to provide all pertinent information to their readers, specifically refusing to fully quote certain conclusions of this newly released PP report, while the writer deliberately misleads readers as to the findings using his own "interpretation" rather than letting the report speak for itself.